This three-part series presents the story of North America like you have never seen it before. Amazing photography, computer graphics and state of the art compositing techniques make this unique project a time machine – bringing to life an astonishing world that most of us never dreamed existed. In North America, countless historical reports, books, paintings and documents describe first-hand the extraordinary sights that once greeted explorers, settlers and pioneers. With ingenious ecological and archaeological research, we can now create a picture of what it would have been like to stand on the North American continent and be overwhelmed by the wonders of nature. Award-winning filmmaker, photographer and author Steve Nicholls portrays a world teeming with life. ‘Paradise Found’ recreates the North America of the first explorers. It presents an entirely new view of nature – but it also reveals an intriguing new view of the continent before and during colonisation, and shows that America was built on its natural wealth. The Vikings came to the New World around the year 1000 AD and found rivers choked with salmon and coasts full of fish. And it was one of these fish – cod –, existing in unimaginable numbers that drew people back here at the end of the 15th century. One explorer recalled that the forward progress of his ship was slowed, so dense were the shoals. Basque, French and British fishing boats also found whales in such numbers that they called the northwest Atlantic ‘The Sea of Whales’. This included the now extinct Atlantic gray whale, which hauled itself onto sand bars to bask like a seal, like no whale alive today. When more permanent colonists arrived, they also found rivers literally solid with fish such as shad, alewives, giant sturgeon, and even freshwater lakes teeming with porpoises. In winter, the coasts were alive with wildfowl, and the bays turned white with wintering swans. Flocks of Eskimo curlews descended on the coasts of Canada and New England in numbers that defy belief. These flocks may have guided Columbus to the New World – but today, the Eskimo curlew is extinct. Once the first settlers got a toehold on the eastern shores of the continent, they started exploring the great forests inland. In the north, these forests teemed with fur-bearing creatures. Beavers were so numerous, they transformed the landscape. Bears gathered in groups of up to 200. And through these forests flew unbelievable numbers of passenger pigeons – flocks of billions of birds that took up to five days to pass. There were so many of them that they brought down boughs of great trees when they tried to roost. Yet, despite this natural wealth, the first colonists and explorers suffered miserably. Many died, surrounded by abundance. This was a new world – unfamiliar and misunderstood. It was described as Paradise – but living here was often Hell on Earth. At the same time that cod fishermen were exploring the northeast coasts, Columbus began his voyages around the Caribbean. He and later Spanish explorers left accounts of extraordinary abundance of life. In the sea, huge numbers of enormous fish cruised the brilliant coral reefs, bigger than any around today. Vast beds of sea grass were grazed by herds of thousands of manatees. The now extinct Caribbean monk seal crowded onto small islets to breed, and turtles were incredibly numerous: as they tried to crawl up the beaches of Grand Cayman, the sound of their shells clashing together could be used as a navigation beacon in bad weather. In Mexico and South America, the Spanish discovered enough gold and silver to fuel the European economy for decades, but the real wealth of New Spain – the true El Dorado –was its natural lushness. Baja harboured wealth in the form of vast beds of pearl mussels, but here the Spanish also found seas full of whales, dolphins and turtles – and sharks, so numerous it was impossible to fish without losing the bait in a few seconds. California was possibly the richest area of the whole continent, with vast grasslands as impressive as the great prairies, covered in herds of black-tailed deer and tule elk. Coastal islands thronged with great herds of elephants seals, sea lions and fur seals, whilst enormous rafts of sea otters darkened the shore for great stretches. Running through the heart of the continent are two vast waterways – the Great Lakes and the Mississippi/Missouri river systems. These became highways for explorers and settlers, venturing for the first time into the heart of the New World. And the natural riches along both of these waterways matched and possibly surpassed those of the two coasts. Vast banks of freshwater mussels made it possible to wade across the Ohio in places. Giant alligator gars roamed the Mississippi itself, and shoals of whitefish in the Great Lakes looked like clouds passing through the water. It wasn’t long before French explorers travelled down the Mississippi – and when these people saw the Great Plains, they were overwhelmed. Nothing in Europe could prepare them for the endless horizon of the world’s largest grasslands. 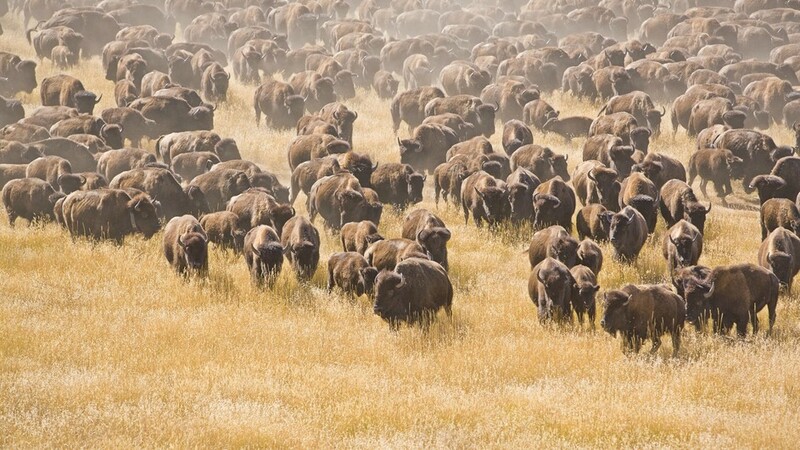 The prairies were home to herds of buffalo that blackened the land to the horizon. Prairie dog colonies were just as vast; one was measured at over a hundred miles long, containing hundreds of millions of animals. Huge herds of pronghorn also migrated across this land, and the first to see these spectacles described multiple packs of wolves, each 30 or 40 strong, trailing the migrating herds. The flocks of geese and ducks were so big as to be literally deafening, and every now and then swarms of Rocky Mountain locusts erupted from the mountains to the west. One of these swarms was bigger than the whole of New England – possible the most numerous animal on the planet. Yet, the Rocky Mountain locust is now extinct – the newcomers to this land have transformed it completely.